It’s human nature to be competitive. We all want to be the best at something. We all like to have our times to shine. And in some ways these times of winning can be healthy. They can boost our self-esteem. They can create confidence which helps propel us toward our destiny and dreams. Winning can provide the opportunities we need to succeed. But sometimes, winning can be unhealthy and damaging. This is especially true if you’re picking someone or something else apart in order TO win. When being the winner every time puts you in a place of ego that requires you to win or fall off the world and die of despair, it can create an unhealthy habit. What habit would that be? Placing negativity or a lesser value on anything that doesn’t make you number 1. Ouch. Yes, ouch. We can’t be the number one at everything all of the time. And just because we might not be number one doesn’t mean we weren’t good or didn’t give good game. It simply means that sometimes we win. And sometimes we don’t. But in no way does it mean that we’ve failed. In fact, as long as you’re in the game, you’re still winning to some degree. The only time we lose is if we quit and stop or simply give up. But striving for perfection at the expense of others is never a good thing. And while you may win, it certainly doesn’t mean you’re a winner. Why? Winners care about their teammates. They learn from people from ALL walks of life. And they are life long learners. Winners don’t know everything. But they’re always learning and striving for excellence. So while we may be striving for the win, make sure you’re not picking someone else apart to get it. I was listening to a conversation between two very loud people in a coffee shop who apparently had nothing nice to say about a friend of theirs. Unfortunately they were speaking to each other loudly, and it was hard not to hear how upset they were over their friend’s apparent rudeness. I mean, after all, how dare she not show up to join them today. As their conversation carried on, it became apparent that she’d had another appointment on her calendar and chose to stick to her priority rather than rearrange her schedule to fit theirs. As a coach, I hear this daily: People wanting to change another person’s schedule and to-do list or list of priorities so it fits theirs. But is that fair? Is it realistic of them to think they can reprioritize someone else’s life to fit their demands, wishes, or desires? No, it’s not. We all have the right to manage our time, energy, and resources to fit our lives, lifestyles, families, staff or team, and according to its unique and specific needs. And we don’t need to allow others to rearrange our plans to fit theirs. At times, we may choose to do so, but it should be because or our own desire, availability, and willingness and not out of manipulation or fear of gossip. While the two women carried on and while their voices carried even over the top of the blenders mixing frozen coffee drinks, I again was reminded of the importance of teaching Part Three of the life management series. What is part three? Minding our P’s and Q’s and honoring and respecting other people’s priorities. That is just a part of it. But it’s a really important part! The final segment focuses on how to be respectful of each other in an “I need to have an explanation of your plans” world . It’s not rude to have priorities and stick to them as you manage your time, talents, and resources in a proper and healthy manner. The goal is not to teach people to become stingy, but rather know where they need to focus based on their individual needs as a family unit, team, or staff. This is smart and keeps individuals from burning out. Priorities that differ are not rude as this conversation loudly proclaimed. But believing that we have the right to manage someone else’s life and then gossip about it because we didn’t get our way is rude and quite embarrassing, I might add. There were plenty of people being exposed to too many flying opinions. Good training and coaching helps us to be mindful of this pitfall and avoid stressed relationships. Bottom line: It IS important to have a proper understanding and mindset regarding priorities: OURS AND OTHERS. The respect for each other’s time, talents, resources, and priorities should be mutual. And priorities that differ doesn’t equal rude. It should remind us of our uniqueness and that’s nothing to gossip about, but rather celebrate and embrace. When my daughter was born I thought child-birth was the hardest part of being a parent. The first time my daughter got sick, I thought watching her have blood drawn was the hardest part of being a parent. Then I thought it was watching her fall down each time she took a step. I thought it was the hardest thing to watch her fall off her bicycle. And I thought it hard to see her go through hurts and disappointments with friends in school. I really, really thought as I watched her grow and blossom through her adolescence that that was harder yet. Every stage has had it’s great moments. And every stage of my daughter’s life has had it’s hard and challenging moments. For me as a parent, I just thought once my kids were grown up things would simply become easier. It wouldn’t hurt so much to watch them become adults. Boy, was I in for a surprise. I started counting down at the beginning of the week. And today I updated my Facebook status with number 6. Why? 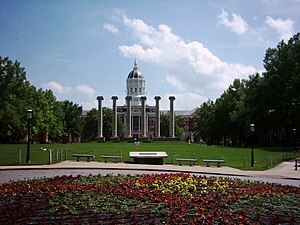 In a mere six days, I will experience a heart wrenching and painful experience as I drop my daughter off at The University of Missouri-Columbia in Columbia, MO. She will only be 6 hours away, and it’s an easy day trip. But as her mother, that really doesn’t help when I think about all the 4,987 things I’m trying to remember to tell her before we depart. Each time I think about hugging her one more time after getting her settled in her dorm and heading back home, each time I think about not tripping over her shoes or finding her belongings strewn across the house, each time I think about cooking one less piece of chicken, each time I think about taking care of her cat for her while she’s just six easy hours away, I cannot control the tears. On one hand, I am so stinking exciting for her! She has busted her hind-end, graduated with high honors, has set her sights on becoming an Archaeologist and studying at an institution of excellence. My heart just sings happiness, and I sincerely feel the joy. I raised her for this! Whooohooooooo! But my heart is feeling something that I absolutely have no words to describe. It’s an inexplicable something that I am joyfully trying to understand. And maybe it’s just a “mom” thing. I have enlisted my dad (her grandfather) to help us drive up and get her settled and unpacked. We’ll be leaving in a little less than a week; six days to be exact. Up early on Friday, getting her settled Saturday, and driving back home on Sunday. I am not driving home. I can’t even think about the trip back without choking up, so Grandpa will be doing the driving back to Hutchinson. I know she’s going to the right school. I know she’s following her passion and her dreams. And I know she has been raised for this moment, in this time, and for this purpose. And I did my job. I did it as well as I could have. My job of raising my little girl to become a grown woman is just about complete, and six days is a signal that this stage is complete in her life. Now I’m going to trust God and his plan for her life and let go. I know that on that six hour drive home, I will be happy, scared, at peace, and experiencing something I just can’t explain other than just to say, “It’s gotta be a mom thing.” And unless you’re a mom, you won’t understand the language the tears speak. I can tell you this much: THIS is the hardest thing I’ve endured yet as a mother. But, at the same time, I wouldn’t trade it for anything. Congratulations, Kiddo. My tears are because I’m so proud, honored, and happy to see you take your first step…into the rest of your life. Have you considered what is going on behind the scenes in the life of someone you know? Equipping people with the tools and skills to persevere and do more than just survive will create a culture of people who can THRIVE! And that is what this post is all about. Consider how you can equip those around you so they can survive what goes on behind the scenes. Consider that you can’t see the whole picture. But you can still equip people well with the proper tools and life skills. I have conversed with numerous people today coaching them on some pretty serious life issues. More than anything, I hope we become focused on equipping people well. Life doesn’t stop. But how we respond to it can make all the difference in the world. And that’s what matters. Consider what you can do to provide skills and training to the people around you.